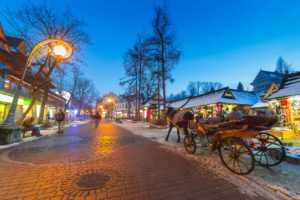 Zakopane, the town where Polish national tourism was born, developed out of a number of shepherd settlements in some forest clearings in the 16th century. Nowadays, Zakopane is known as the winter capital of Poland, and it is beautiful in every season of the year. Professional local guides help to usher in the atmosphere and the uniqueness of the place, and our company offers the services of some of the best local guides, who will make your walk something more than the usual sightseeing. Transport in the centre, for example, is made using a typical highlander horse cart. Our tour will start with a stroll along Krupówki Street – one of the best-known Polish promenades and attracting visitors from all over the world. One can find various kinds of architectural styles along this small local boulevard. While walking here you will pass numerous bars, pubs, inns, restaurants and various shops. Next, you will have an opportunity to take a ride up a funicular railway to the top of Gubalowka Hill and to see a stunning view of the Tatra mountains, and also of other mountain ranges: the Gorce, the Pieniny and the Beskid. After a gentle walk around the peak, you will return to visit the oldest parts of Zakopane, such as the beautiful timber lodge of Villa Atma with its archetypal Zakopane style architecture and now used as a museum, and the famous cemetery of “Na Pęksowym Brzysku”, a place so sentimental and special with many “gravestones” in the birch grove made of wood. These grave markers are considered to be supreme works of art. The last stop will be the wooden Old Church built in 1847. Friendly and knowledgable guide. Very experienced guide who was well recognized throughout the town. Adam was able to take us to unique locations and local sights: local art school with student exhibit, regional sheep cheese shop with friendly and explanatory details of process and business model. Would have liked to have heard more about local as we [...] Read full review walked the streets of Zakopane.